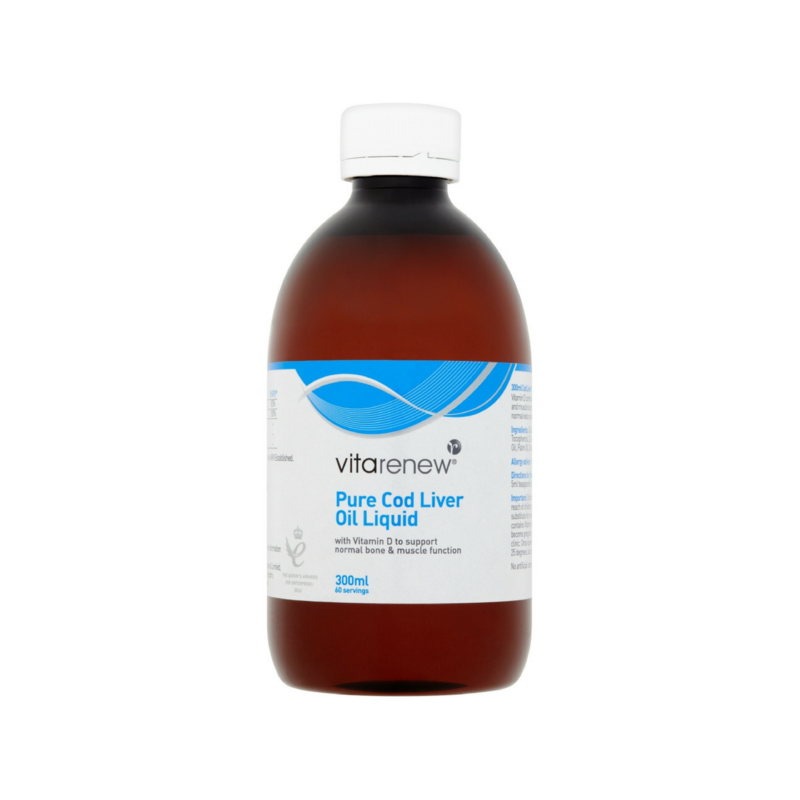 Vitarenew's Pure Cod Liver Oil Liquid, contains a high concentration of Omega-3 fatty acids. with 920mg of EPA/DHA per serving. These important fatty acids have cardioprotective benefits and contribute to brain function and joint mobility. This Cod Liver Oil liquid is also high in Vitamins A and D which contribute to normal; skin, vision, bones muscles and teeth. As the name suggests Cod Liver Oil is taken from the liver of the cod fish and is rich in Eicosapentaenoic acid (EPA) and Docosahexaenoic Acid (DHA) Omega-3 fatty acids. As it is derived from the liver where Vitamin A and D are processed and stored, it is also a good source of these nutrients. What are the health benefits of Cod Liver Oil? > Heart Health: The important Omega-3 fatty Acids EPA & DHA have cardio-protective benefits and support the normal function of the heart. > Immune Health: Vitamins A and D contribute to the normal function of the immune system. > Eye Health: DHA and Vitamin A contribute to the maintenance of normal vision. > Mobility: Vitamin D contributes to the maintenance of normal muscle function and bones. There is also some evidence that Vitamin D supports healthy joints and EPA may help prevent inflammation. > Brain Function: Omega-3 fatty acids contribute to the maintenance of normal brain function. Who should take Cod Liver Oil? In order for us to increase our Omega-3 intake, the UK government recommends eating 2 portions of fish per week with one of these being oily fish. For those people who don’t eat much fish taking a Cod Liver Oil supplement is a good alternative as it is high in EPA and DHA Omega-3s. With the lack of sunlight in the UK a lot of people aren’t getting enough Vitamin D. This has lead to Public Health England (PHE) recommending that everyone should take a supplement containing Vitamin D especially during the winter months. As Cod Liver Oil is one of the richest, natural sources of Vitamin D it is a good option for the majority of people in the UK who aren’t getting sufficient sun exposure. * NRV = Nutrient Reference Value. Adults and Children over 16 years: Take one 5ml teaspoonful daily. Do not exceed the recommended daily dose. Cod Liver Oil (Fish)(99%), Antioxidants (Mixed Tocopherols, DL-Alpha Tocopherol), Retinyl Palmitate, Sunflower Oil, Palm Oil, Cholecalciferol. Do not use if cap seal is broken. Keep out of sight and reach of children. Food Supplements should not be used as a substitute for a varied diet and healthy lifestyle. This product contains Vitamin A: do not take if you are pregnant, or likely to become pregnant, except on the advice of a doctor or antenatal clinic.